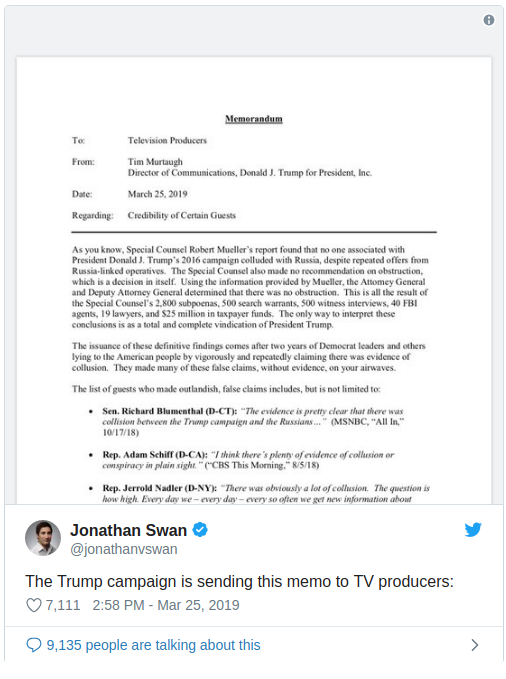 The Trump administration has sent a memo to TV producers which contains a list of Russian collusion liars, advising networks to challenge individuals like Rep. Adam Schiff on their false claims in future. The memo, sent by Trumps Director of Communications Tim Murtaugh, was sent a day after the Mueller investigations conclusion which completely vindicated President Trump. They made many of these false claims, without evidence, on your airwaves, the memo adds, before giving an example for each of the individuals named. While Trump has zero power to tell the media who they can and cant have on as guests, leftists will undoubtedly weave this into their wider conspiracy theory that the president is trying to intimidate and shut down the media. If you'd like to read the full memo, you can see it here. File defamation suits. The actual malice standard is met. A full counter investigation is in order and I PRAY President Trump gets them in his sites and purges America of their stench. Trump and the Trump Campaign should show no mercy. Full Game of Thrones revenge time. I so completely admire the gumption of this man. He may be rude, he may exaggerate, he may be crude, but wow, does he fight the people I despise, and for that, he has my admiration and respect! That’s probably the purpose of the communication. Now if those guests repeat the same lies and aren’t challenged, a case for malice can be made. Click on the link (in my comment) and read the whole memo for yourself. It appears the Riot Act has been read, or the shot is across the bow. Another way to look at that list is they are likely going to be indicted soon. Going to be an interesting few months, and hopefully weeks. Trump is putting the enemedia on notice that any more of this Russian Delusion nonsense will be libel/slander and it will also be malicious. The lawsuits will then follow. A case for actual malice can already be made. This is NOT coming from the White House, I dont think? Perhaps the 2020 Campaign, because its DJT Incorporatrdon the letter head. Too bad we can’t start building scaffolds outside their offices. The sound of the hammering might help clear the mental fog they operate in.